Wine collections should be kept in a storage structure that is not only functional and dependable, but also beautifully designed. Coastal Custom Wine Cellars, an expert builder in California, recently completed a unique home cellar project for a client in Los Angeles, California. The construction team made sure that the room was capable of providing the tightly sealed space that wines need. They also designed the residential cellar with meticulous detail, in order to meet the client’s style and preference. Coastal Custom Wine Cellars, an expert storage builder based in California, designed and built a unique wine room in San Francisco. This home cellar can house bottles of various sizes. Coastal Custom Wine Cellars recently completed a construction project in Los Angeles. The client wanted a home wine cellar with a unique design. He also wanted his storage room to accommodate wine bottles of various sizes. The client had a one-of-a-kind concept in mind for his wine cellar’s design. Instead of keeping wine exclusively, he wanted his storage room to have a space for his Bourbon collection. Coastal Custom Wine Cellars’ builders included open bins on the cellar’s right side. This area was allocated for the client’s liquors rather than wine. A display row was built on the left side of the residential cellar, and it was made to accommodate large format wine bottles. The contractors designed label-forward spaces, so that the bottles are safely cradled in a shelf. These racks can fit a variety of bottle sizes, anywhere from 1.5 liter to 12-liter wines. There are shelves on both the left and the right side of the storage room that are specifically created for magnum-sized bottles. The kind of racks and displays in this Los Angeles cellar are ideal for those who enjoy collecting an assortment of bottles. The wine room was distinct and gorgeous. Label-forward wine racks were added to the display, so that the bottles can simply be cradled on the shelves. Spaces for magnum-sized wine bottles were also included. The concealed lighting added sophistication to the Los Angeles home wine cellar’s design. An elegant arch was added above the cellar’s tabletop area. This arch is distinct because instead of a visible stemware rack, it has an inset on both its left and right sides. The client can hang up to four wine glasses upside down, by their bases, in each of the inset spaces. Below the tabletop area are a set of drawers. It’s in these compartments that the client keeps his napkins, corkscrews, and other wine tasting basics. One of the things that make this Los Angeles custom wine cellar stand out is its fantastic lighting. The storage room is properly lit with rich and vibrant colors all throughout. To add accent and make the displays pop out, concealed lighting was also included. 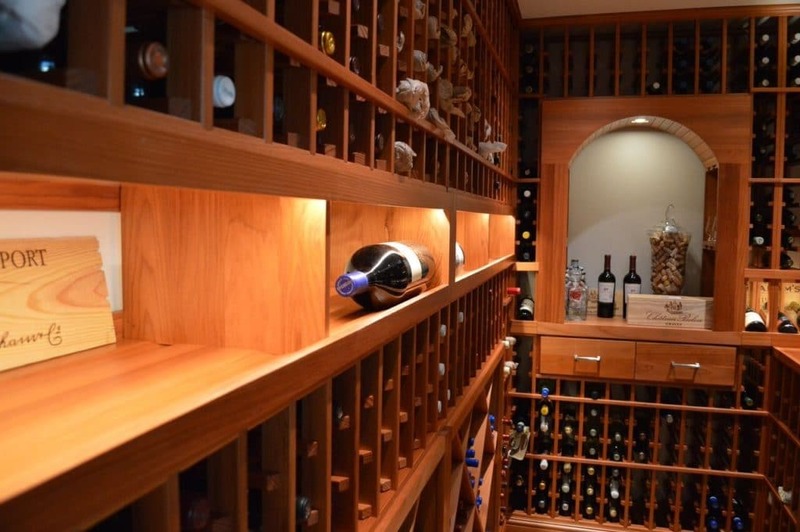 The construction of the Los Angeles home wine cellar was a success because the client and the contractor had a very healthy working relationship. The key to accomplishing a project with flying colors is proper planning and good communication. Since the client’s home was near the main office of Coastal Custom Wine Cellars, the storage experts were able to visit the site before the construction commenced. 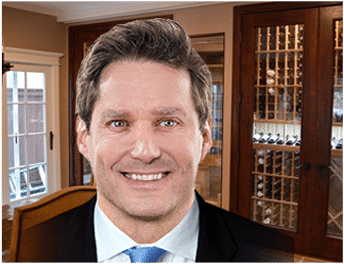 The wine cellar specialists were able to take accurate measurements of the room, discuss with the client their options, present various wood finish samples, etc. As a result, every detail of the client’s needs and preferences were perfectly met in the process, when they started to work on the cellar. Get a unique design for your home custom wine cellar! Discuss your style and preference with an expert! Click here! A cellar door should be both functional and beautiful. The design of the Los Angeles wine cellar door adds elegance to the storage room. Coastal Custom Wine Cellar designed and built the arched wrought iron door based on the client’s style and preference. The door of a wine storage room plays an essential role in keeping the space tightly sealed. A poor quality cellar door can adversely affect the function of the refrigeration system. But besides its function, a custom cellar door should also be beautifully designed. How a door is built can either add or reduce the aesthetic appearance of a storage structure. Coastal Custom Wine Cellar constructed the Los Angeles residential cellar door with a design that would meet the client’s preference and match the wine room’s style. 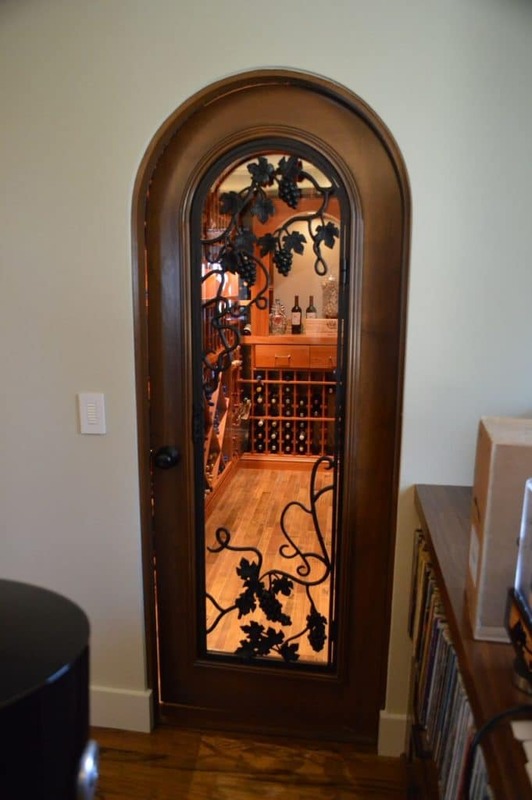 The Los Angeles home wine cellar door was made of wrought iron with details of grape clusters and vines added, and it has an elegant arch or radius top. The design on the door is called “The Huntington,” because it was originally conceptualized and drawn by a previous client from Huntington Beach. Many of Coastal’s clients love the design, and that is why it has been used a number of times in different wine storage rooms. The Los Angeles residential cellar door is approximately eighty inches in height. 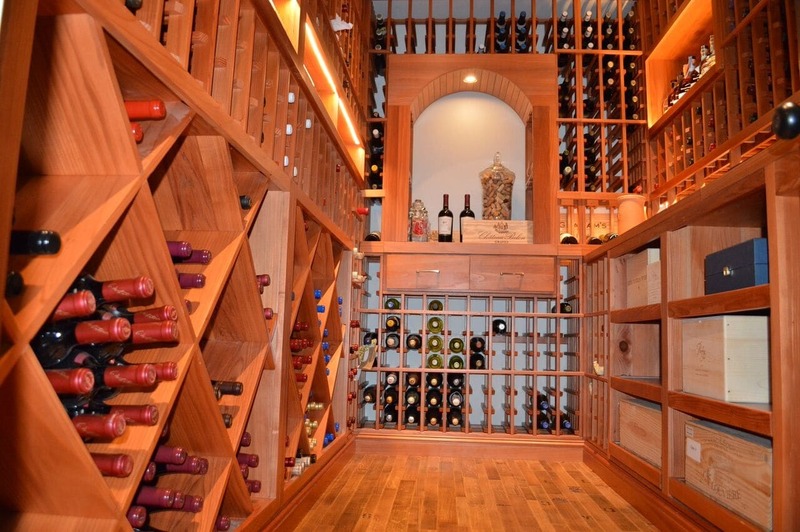 Coastal Custom Wine Cellars offers a wide array of sizes, shapes, and styles of wine room doors. Their services encompass everything for these doors, including casement moldings, dual pane glass, weather stripping, jamb, and self-sealing door bottom. Have your residential custom wine cellar door designed by an expert! Call Coastal today! Click here! If you want to make sure that your cellar, whether for residential purposes or for business, can provide the tightly sealed space that wines require, you need to have it built by a professional. Coastal Custom Wine Cellars is a premier wine storage construction company with more than a decade of experience in building high quality wine rooms. Coastal is reputable for providing quality services and consistently meeting their client’s utmost satisfaction. Want to know more about Coastal Custom Wine Cellars’ products and services? Call them today at +1 (888) 735-8889!